Recently Chewy.com offered us a free sample of Orijen Cat Treats. In our never-ending quest to find something healthier for Maxwell to eat, we never turn down an opportunity to try out a new taste sensation that might appeal to his discriminating palate. The treats were freeze-dried, and 100% meat. What I like about them is that you can choose a single source meat such as lamb, raised in Alberta, Canada. Did the crew like it? Maxwell & Faraday both did the smell-test first. Faraday took his time, checking it out thoroughly. Along with the sample came a brochure from Orijen that explained how they source their ingredients, and what their philosophy is. I have to admit, I liked reading this statement, "Our fresh ingredients arrive at our kitchen within a day or two of harvest. We think pet lovers want to know where the ingredients in their pet’s food originate. That’s why we focus on ingredients that are sustainably raised within our region by people we know and trust, passed fit for human consumption, and then delivered to our kitchens." Human grade food? Excellent idea. Having your ingredients arrive fresh, and from local farmers and ranchers? Love it! I was thrilled to read that Orijen had a food line called Whole Prey. Its philosophy was to truly mimic the natural diet by incorporating appropriate portions of organs, cartilage and bone marrow along with the meat. So I went out to purchase a can. Sadly, I found they only had dry food, which we do not like to feed at our home. Hopefully the company will someday offer canned. If so, we would be interested in trying it! FTC Disclaimer: Chewy.com provided us with a free sample of the Orijen cat treats to test, but all opinions are our own. Looks like a hit with you Faraday. Enjoy. Have a marvellous Monday. PS/ Our local distributor claims they "can't" bring in the Orijen treats. BAH. The only treat I tasted was the Greenies Dental treats. I like it but I hope there's variety. I'm with you and the whole canned food thing. I so hope they come out with a line of it.. I love Orijen treats and their Tundra freeze-dried food for dogs! They are a great company and I also love their philosophy regarding the ingredients they use. My concern about human grade food is that the humans will try to eat it! Those treats look good. We'll have to look for them. Thanks for the review. We have some of those to try, and we can't wait now that they are Faraday-approved! Golly, I'm Mr. Picky but those treats sound GOOD for me and very nommy....I may have to mention these to my Mom! 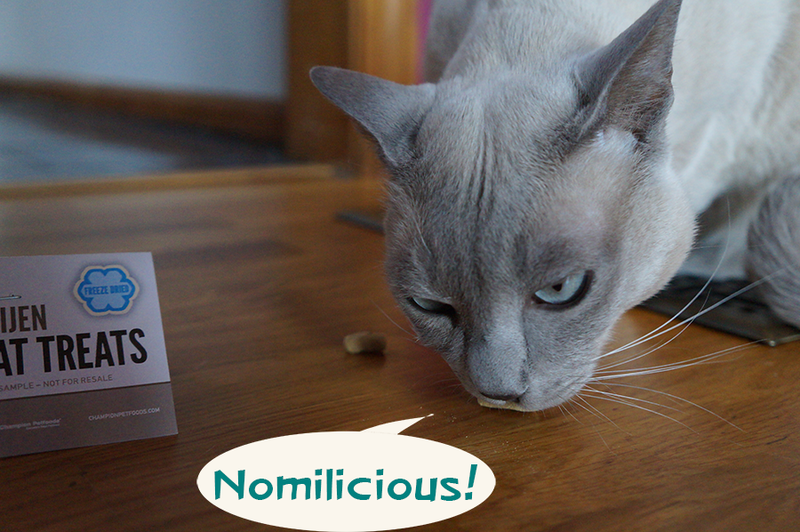 They do sound *nommy* ! You had me at freeze-dried. Have you seen my freeze dried salmon?